"The Dreamliner boasts a more spacious cabin, touch-screen televisions and black upholstery"
More spacious than what? It isn't mentioned that it is replacing the airline's Boeing 767s and yes it is wider than them, but more seats are being squeezed into each row as well. Instead of a 2-3-2 configuration in a 4.72m wide cabin, it is 3-3-3 in a 5.49m cabin. So that's actually LESS spacious in economy class per seat. Touch-screen "televisions" (inflight entertainment monitors is more accurate, but I'll let that pass) are already installed in the Boeing 767s, so that's hardly a big deal. It is a NEW inflight entertainment system, but that isn't mentioned. So one inaccuracy and two meaningless points. "In first class, "business premier", the toilet has a black and white butterfly wallpaper for passengers to ponder." No, there is no first class. Air NZ hasn't had first class since 2004. Business Premier is actually business class. There are airlines with both first and business class, like Singapore Airlines and Emirates. However, the toilet wallpaper is an odd thing to notice. So, another inaccuracy and a meaningless observation. First class is nice. There are only 18 seats in first class, each in their cosy pod, and they can be turned into beds. The televisions have a swivel function and the area has its own cabin crew. There is no first class! The writer might have noted that these are very similar to the seats already seen on the Boeing 777s, with the "televisions" having a swivel function and yes, oddly enough, business class always has its own cabin crew. Repeating the same inaccuracy and pointing out almost nothing that is new, except the seat count. In economy, the leg room seems much the same and the screens don't swivel. The toilet wallpaper shows a bookshelf. The legroom is fairly similar to the 767s, but seat width is apparently slightly less. The screens don't swivel perhaps because they aren't in a business class pod! 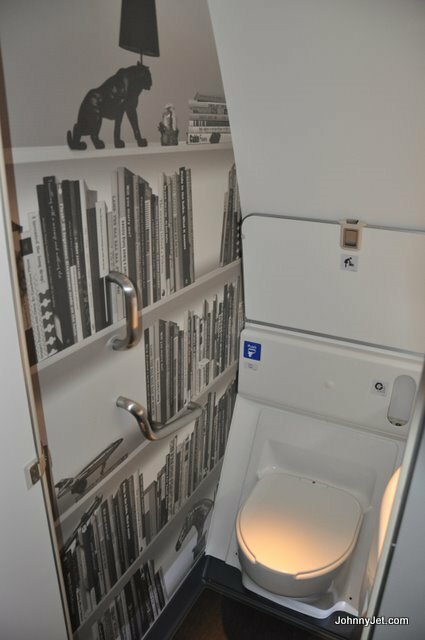 Yes the toilet wallpaper shows a bookshelf, like on the Boeing 777-300s Nothing new here. However, but wait? What about Premium Economy? It is a brand new seat, not seen on the airline before, but it is completely ignored. The Boeing 767s don't have premium economy, so why was that ignored? So it is accurate, points out two points that are not new and completely ignores the new cabin with new seats not seen before on the airline. To enjoy the plane's most talked about feature, the Skycouch, you will need to buy three economy seats in a row or have flexible standards on who you cuddle up to. For a start it is not the plane's "most talked about feature". That would be the fact it is 50% made of composites, not aluminium, which means the onboard humidity is double that of other airliners, and pressurisation is higher, so that there should be much less dehydration and more comfort on long flights. The much larger windows (50% larger on average) are also a feature. Australian Business Traveller has written about all of these. The Skycouch is not new to the Dreamliner though. Air NZ has been selling Skycouches since 2011, as they are offered on the Boeing 777-300s. Not new, except the Boeing 767s don't have them. and no, you can't get a Skycouch with a stranger, so "have flexible standards on who you cuddle up to" isn't going to happen. You either buy 1-3 seats with a Skycouch option, or you don't and the seats sell as conventional economy seats. This is basically drivel, ignoring the most revolutionary features of the plane and then getting something wrong. The whole plane has flashy new windows that tint at the push of a button and you can charge your phone using a USB connection on the back of the seat in front. Finally, something actually new. However, Boeing 767s have USB connections in the seats now, so nothing new there. Air New Zealand promises prices for flights on the Dreamliner - to Perth, Tokyo and Shanghai - will not go through the roof. Why would they? Does the introduction of new planes correlate with higher fares? No, it doesn't. What a stupid inane statement. One that Air NZ will be less than happy about because it implies fares will go up, just not that much. In conclusion, this was an appalling effort. I hardly think it was worthwhile writing this drivel. The mainstream media is sometimes disparaging about blogging and amateur journalism. To that I can only laugh when this is the standard that is allowed to get published, and people are expected to pay for it.